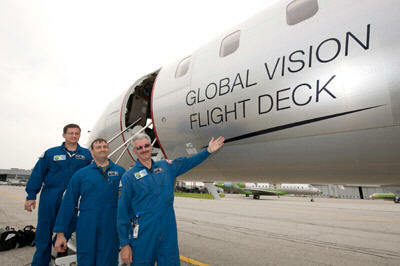 Mark Mondt, Flight Test Engineer, Jeff Karnes, First Officer, Gary Bruce, Project test pilot. August 4, 2009, Bombardier’s Global Vision cockpit successfully completed its first Bombardier test flight on a Global Express XRS aircraft on August 3. Dedicated to testing basic system functionality, the flight marks another significant milestone for the program. The Global Express XRS aircraft departed from Bombardier’s Downsview facility in Toronto, Ontario, at 10:20 a.m. EDT and returned to Downsview for landing at 3:28 p.m. EDT. The flight reached a maximum first flight altitude of 17,000 feet (5,181 m), and a true airspeed of 343 knots (395 mph; 635 km/h). The aircraft was loaded with 22,600 pounds (10,251 kg) of fuel and weighed 74,885 pounds (33,967 kg) for takeoff. Upon completion of initial flying the aircraft will be ferried to the Bombardier Flight Test Center in Wichita, Kansas, where it will complete a rigorous flight test program, resulting in Transport Canada, FAA and EASA type certification. Scheduled for availability on Global 5000 and Global Express XRS jets, the Global Vision flight deck merges leading-edge design with advanced technology to deliver a completely new cockpit experience. It pairs the latest technological advancements from Rockwell Collins – the Pro Line Fusion avionics suite – with superior design aesthetics to create the ultimate flight control environment and provides pilots with an unprecedented level of situational awareness and comfort. Avionics suite integrates the latest in advanced technology features. The new Pro Line Fusion – Rockwell Collins’ most advanced avionics suite technology – makes its debut on the Global Vision flight deck. Pro Line Fusion provides an integrated flight deck to ensure interoperability between systems and overall increased efficiency. The avionics suite features four high resolution 15-inch diagonal active matrix liquid crystal displays working in concert with the Head-up Guidance System (HGS®), personalized formats of display information, electronic checklist, maps with graphical flight planning, integrated cursor control panel, paperless operation enabled by dual electronics charts, future air navigation system, controller-pilot datalink communication and MultiScan weather detection system, synthetic vision system and Bombardier Enhanced Vision System (BEVS). The all-new BEVS, featuring the new CMA-2700, – CMC Electronics’ third-generation SureSight I-Series integrated sensor system for enhanced flight vision system applications – will provide pilots with significantly improved situational awareness and the ability to observe runway lights and the runway environment in difficult operating conditions, such as low visibility and darkness. BEVS also offers lower approach minimums under certain situations. The Global Vision flight deck reflects the overall superior design and exceptional aesthetics of Bombardier’s flagship aircraft. The flight deck area is designed to maximize ergonomic function and styled with the same attention to detail and high quality materials used throughout the cabin: luxurious leathers and suedes, brushed chrome and carbon-fibre accents to create an entirely new flight command experience and a wider looking flight deck. Adding to the comfort of the cockpit environment, map lighting and sunvisors are positioned where they are most effective, and storage space within the pilots’ reach has been increased and designed to integrate smoothly into the flight deck area. A darker colour scheme and redesigned seats for both the pilot and co-pilot, which feature carbon-fibre, leather and sheepskin, provide an overall sense of comfort and warmth. The high-speed Global 5000 jet combines superior transatlantic speed with the largest cabin in the super large segment. The aircraft can connect New York-Honolulu non-stop with eight passengers and three crew. The pioneering Global Express XRS business jet features the largest cabin of any purpose-built corporate aircraft – offering more cabin volume and more floor space than its closest competitor. No other business jet in the ultra long-range segment matches the high-speed range capability delivered by this aircraft. Offering the ultimate in cabin comfort, this impressive jet can link Montreal-Moscow non-stop with eight passengers and three-to-four crew.